David Rampil, Anti-tank Missileman, Marine Corps. David Rampil, Stony Brook University student. Photo by Rebecca Anzel. David Rampil always sits in the back of the classroom. It is a habit ingrained in him during his Marine Corps training before he deployed to Afghanistan in 2013. Rampil and his colleagues learned to take note of life-saving details, such as the number of nearby exits and the mannerisms of local villagers. They also learned to look for signs of a roadside bomb. Afghan villagers marked the site of pressure-plate bombs to alert other villagers to danger with objects Marines did not always notice, including rocks and piles of trash. It is now second nature for Rampil, a student at Stony Brook University, to position himself so he is not completely surrounded by other people. His preferred spot in the rear of a lecture hall allows him the ideal vantage point to see what everyone in the room is doing. Rampil said he remembers sitting in the back of his Anthropology class in Frey Hall on a recent morning when a student arrived late, wearing a generic SBU-themed hoodie and sweatpants. He watched the student snap a picture of the lecture slide on the screen and then turn to take a photo of the security camera above the rear doors before abruptly leaving. Rampil’s fellow classmates seemed not to notice. Watch David Rampil describe his Frey Hall experience. Rampil is one of thousands of veterans who are returning to U.S. campuses as American troops withdraw from conflicts in Iraq and Afghanistan — about 790,000 veterans used education benefits in 2014. There are about 200 veterans enrolled at Stony Brook for the spring 2016 semester, according to the university’s Veterans Affairs Office. As the only combat veteran on campus this semester, Rampil’s experiences are both typical and atypical of other veterans. Ismael “Izzy” Rodriguez, director of Veterans Affairs, said veterans are older than traditional college students. They typically have a spouse or long-time boyfriend or girlfriend, and some also have children. Many find it difficult to relate to younger students. They do not spend a lot of extra time on campus either. Rodriguez said he believes they maintain a “mission-oriented” mindset from their military training — veterans tend to look at tasks and focus solely on getting them done. Joining clubs, participating in campus life or waiting for an appointment are often perceived as a waste of time. Rampil fits the general profile. At 25, he is older than many students on campus. He is in a serious relationship with his high school sweetheart and he has an intense focus on completing his Anthropology degree quickly so he can use whatever is left of his education benefits to pursue a masters degree — he is unsure in what subject. But he differs in his commitment to the Veteran Student Organization. As the group’s secretary, he spends time on campus working to connect veterans with the rest of the campus community. Like many veterans who served in Iraq or Afghanistan, Rampil was lured back to school due to generous benefits provided by the Post 9/11 G.I. Bill. The funding fully covers tuition and fees at public institutions at the in-state rate for 36 months and provides a textbook stipend and housing allowance. Before enlisting in the Marine Corps, Rampil majored in software engineering at the Rochester Institute of Technology and participated in the Reserve Officers’ Training Corps. 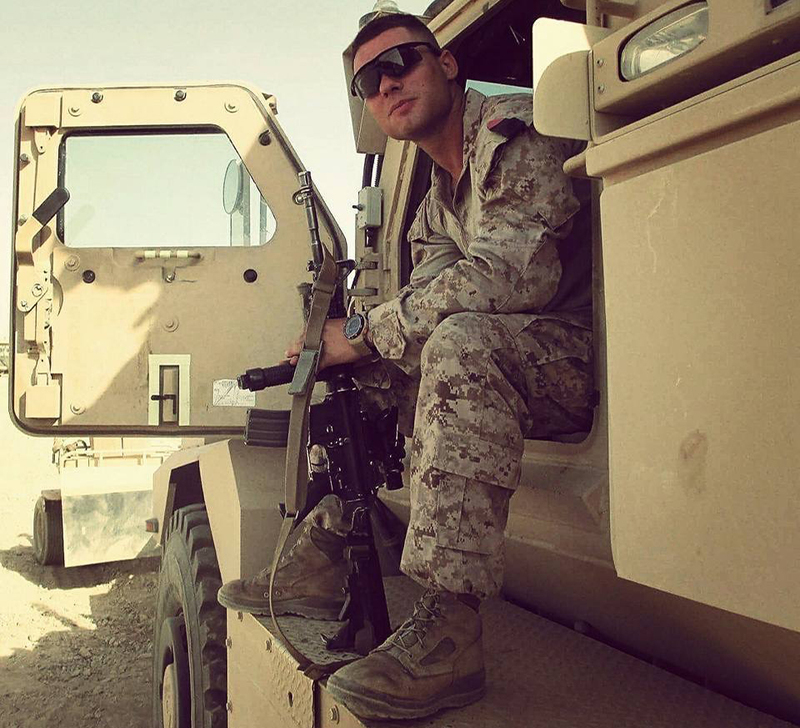 He left RIT and enlisted in the Marine Corps in 2011 because he wanted to fight the war on terror. During a delay in the enlisting period, Rampil enrolled as a Biology major at Stony Brook, where both his parents were professors. Rampil said it was during his deployment in Afghanistan that he realized he wanted to pursue anthropology. The Marines worked with a CIA group called the Human Exploitation Team. Agents studied the culture of the local populations, writing reports on what soldiers should expect and what cultural practices they should observe and respect. Rampil knew the Post-9/11 G.I. Bill provided financial support for an education and decided to take advantage of it to work toward his new career goal. But he said the generous benefits were not his only motivation. Re-entry is not always easy. Student veterans rely on Rodriguez, a veteran of the Iraq War, for help with their benefits and navigating other challenges. His office links veterans to representatives from Academic Advising, Disability Support Services and Counseling and Psychological Services. At Counseling and Psychological Services, or CAPS, Clements is the veteran liaison. Trained in Georgia, she came to CAPS from a Veterans Administration mental health clinic in Atlanta where she provided one-on-one therapy, group therapy and risk assessments. That experience, she said, helps her to better understand what service a veteran might benefit from and how to provide that service most efficiently. Her knowledge about the military and its jargon helps veterans open up to her. Because some students on campus do not want to self-identify as a veteran, Clements keeps items — such as a Marine Corps magnet and mug — in her office to invite conversation. Marissa Clements, Psy.D, coordinator for Triage and Practicum Training, in her office in the Student Health Services building. Photo by Rebecca Anzel. She said this helps to put students at ease, which can be especially valuable when she is working with a veteran who has posttraumatic stress disorder. Due to concerns about patient privacy, Clements would not speak about her work treating individuals with PTSD on campus. But she did note that because CAPS is a short-term treatment center, she will often recommend a clinician in the area for longer-term treatment. According to the U.S. Department of Veterans Affairs, 10 to 18 percent of veterans returning from Iraq and Afghanistan are likely to have PTSD. For veterans, working through intense issues is sometimes complicated by their other demands on campus. “It might not be appropriate to really dive into trauma work in October or April when the students are also trying to manage the stress of their academics or if they have to move,” Clements said. Brandon Bjertnes, academic advisor, in his office in the Melville Library. Photo by Rebecca Anzel. 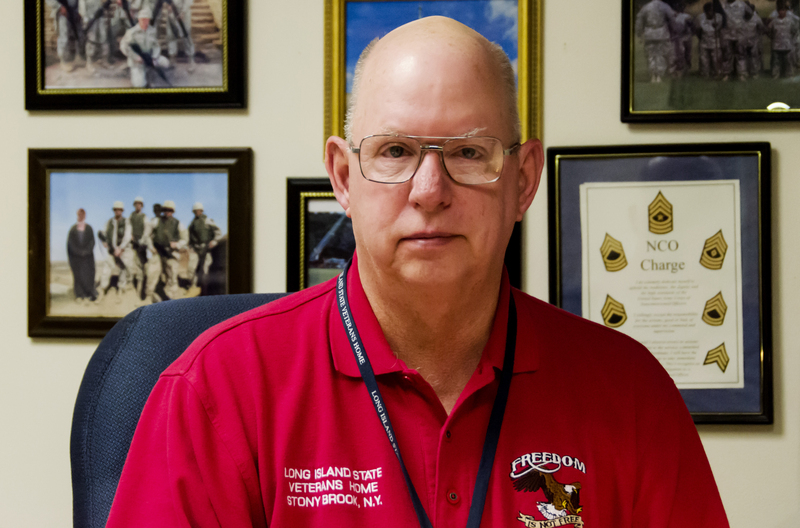 Veterans typically come into Stony Brook with credits from an institution they attended before enlisting in the military or courses they took at a community college after leaving the military. 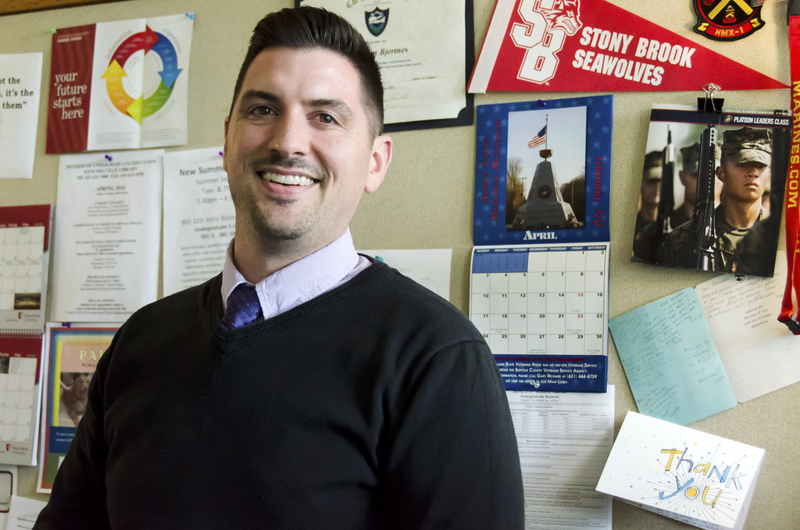 Navigating the path to graduation at Stony Brook can be difficult, Academic Advisor Brandon Bjertnes said, in part because of moving parts and requirements, like financial aid and university requirements, that need to be reconciled. For example, veterans cannot utilize the voluntary graded/pass/no credit option — which allows students to opt for a grade that will not be recorded in their official transcript — because the benefits outlined by the G.I. Bill do not formally recognize a course with a grade of pass or no-credit. This is the case with many scholarships and grants as well. Bjertnes said navigating the maze of requirements can be confusing. 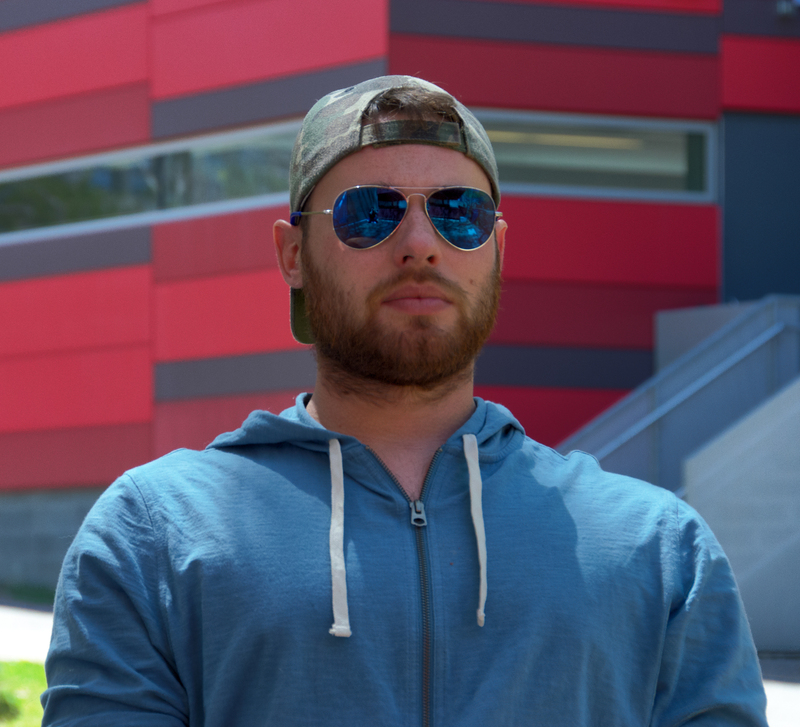 Stony Brook’s Veteran Student Organization, which connects veterans to other veterans, is resource for veteran students to successfully navigate the challenges of pursuing a higher education. The organization is a student-run group consisting of veterans, military family members and non-veteran students who support veterans issues. All but one position is filled by a Marine. The group’s vice president, Tiara Miller, is a civilian. Miller, 23, is a German and Sociology major. Prior to joining VeSO, she said she felt alone on campus. Last spring, she attended a screening of a military documentary and a group discussion afterwards. Veterans openly talked about their experiences. A few spoke about their struggles with PTSD. Miller felt she could never talk about her own fight with PTSD, which she developed after a traumatic personal experience, but she felt comfortable doing so with the men and women at the meeting. Miller now works in Rodriguez’s office in addition to fulfilling her duties as the club’s vice president. She said these experiences have helped shape her career goals — she wants to continue working with veterans and aspires to be a director of Veterans Affairs at an institution of higher education. VeSO is a way for veterans to connect with the campus community, club leaders said. Programs, fundraisers and meet-and-greets — such as the two Call of Duty tournaments the club hosted this semester — are low-pressure ways for veterans to raise awareness on campus that there is a veteran presence. Members say they often think other students do not realize this. The organization also advocates for change at the university. Rampil is heading efforts to allow veteran students to receive priority enrollment each semester, something he said is important because they are paying for their education with benefits from the G.I. Bill, which has a time limit. 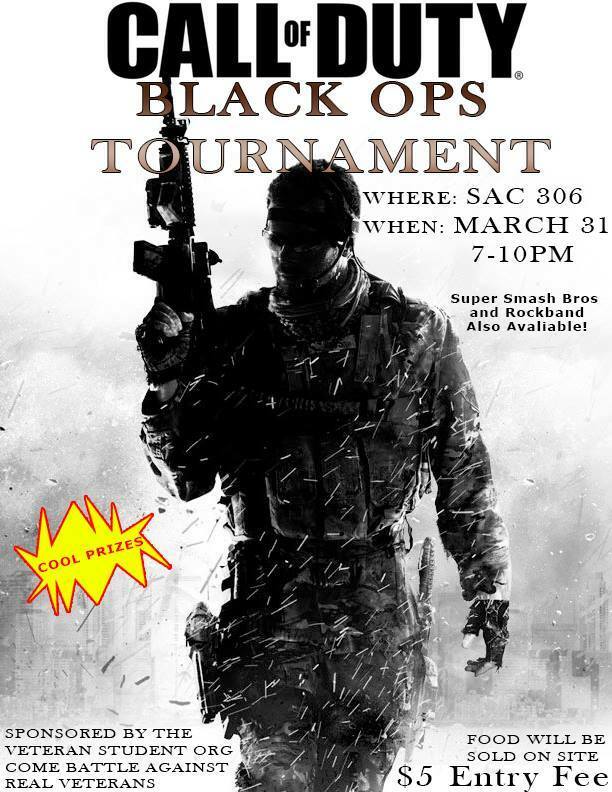 VeSO’s Call of Duty tournament is one event the club hosted recently. About 40 students were in attendance. Pushing veterans toward pursuing a higher education is vital for their success later in life, Rodriguez said. Many institutions of higher education offer career resources, like resume building and interview tips, which, coupled with a college degree, helps veterans secure a well-paying job. Mike Rella, nursing student in SBU’s Veterans’ Bachelor of Science Degree in Nursing program. Photo by Rebecca Anzel. After a seven-month tour in Iraq in 2003 with the Marine Corps, Corporal Michael Rella was heading home. The native Long Islander had enlisted in the Marine Corps in 2000 directly out of high school. After completing boot camp, Rella went to SUNY Maritime College for marine transportation before being called up on Jan. 28, 2003 — his 21st birthday. education he completed before being deployed, he did not have much trouble securing the job. 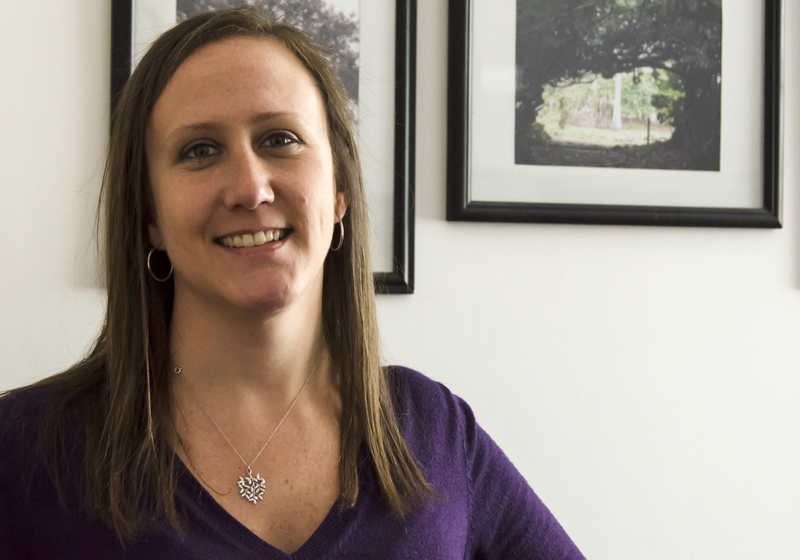 Now 34 and with two young children, Rella is enrolled in Stony Brook’s Veterans’ Bachelor of Science Degree in Nursing program. The switch in careers gives him a shorter commute and the option to less “mind-numbing” work than operating a ferry all day. The program, which started in 2014, is designed to give veterans college credit for their military experiences and prepare them for a career in a field where there is a growing demand. It is funded by a $1.3 million federal grant from the U.S. Department of Health and Human Services’ Health Resources and Services Administration — SBU is one of nine institutions nation-wide selected to receive this grant. For Rella, nursing made sense — it runs in his family. His mother, uncle and aunt are all nurses. He did not have much experience from the Marine Corps aside from basic first aid, but he said he has picked it up rather quickly. The program includes group sessions and equine therapy for those students who may be suffering from anxiety or PTSD or having trouble readjusting to civilian life. It is one of the things the program’s directors added after learning “there’s more difficulty transitioning to civilian life than what we had previously thought,” Associate Dean for Evaluations and Outcomes Lori Escallier said. “Some of the vets I know from the program, when we get to meetings and stuff, you can tell some of them are off a little bit,” Rella said. He has two older brothers and one younger one, and the four brothers always poked fun at each other. When he first came home from Iraq in 2008, he said he was really sensitive to the teasing. 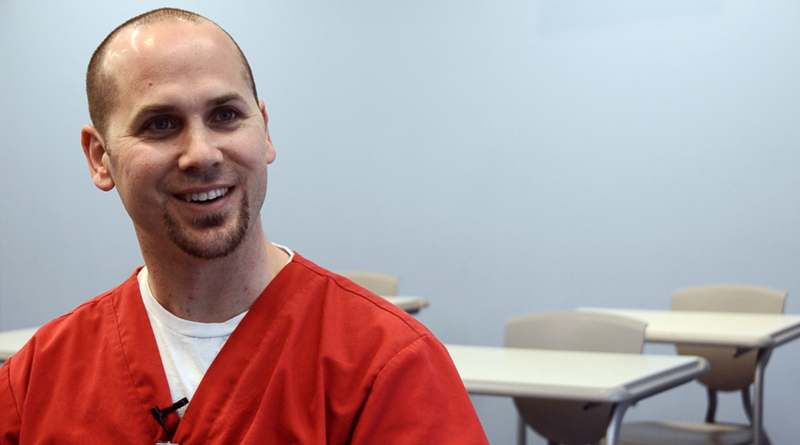 Watch Mike Rella describe his experience with his brothers. He graduates from the nursing program in May and hopes to get a job with Stony Brook University Hospital. The program is ending in 2017 when its grant expires, but Escallier said she is hoping a competing continuation will be offered so Stony Brook can apply to have the grant extended. Gary Richard, veteran service officer at the Long Island State Veterans Home. Photo by Rebecca Anzel. Gary Richard retired from the Army after a 30-year career and now works as a Suffolk County veteran service officer to help other veterans. He knows first hand how difficult it is to transition from serving in the military to a civilian life. One of the most challenging aspects of his transition, Richard said, was learning to trust Muslims living in the U.S.
For months, he refused to let Muslim nurses or doctors treat him for injuries sustained in Iraq at the Northport VA Medical Center. “The issue is transitioning from a combat zone to civilian world where there are Muslims that are part of our culture. When you come back, it’s hard to deal with people that are Muslim,” he said. “They were trying to kill me and my soldiers there. As part of his PTSD therapy, he said, and after self-reflection, he consciously began remembering Muslim individuals he considered his friends. 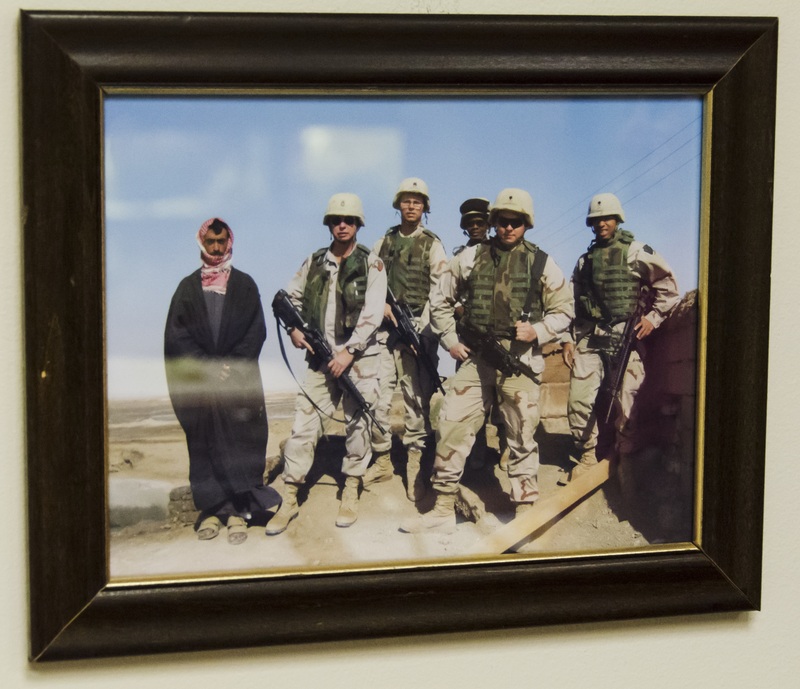 One, an interpreter for his unit in Iraq, is pictured in a framed photograph hanging behind his desk. He uses that technique — remembering important Muslim men and women from a soldier’s past — to help other veterans who call him with similar problems. As an advocate and representative for veterans from World War II and the conflicts in Vietnam, Korea, Iraq and Afghanistan, Richard’s job is to ensure veterans receive any and all benefits they are eligible for. This is the image Richard, third from the left, mentions in his story. Photo by Rebecca Anzel. He also acts as a mentor to veterans who visit him at his office in the Long Island State Veterans Home with problems. These veterans trust him, Richard said, because he understands the problems. Has faced many of them himself. Are you a veteran who returned from military service and pursued a higher education? Do you know someone who has? Share your story and connect with other veterans.